So much has been written about this incomparable sire that I will give only a bare outline. Ch Halstors Peter Pumpkin ROM was a sable dog bred by Edith Overly from Fair Play of Sea Isle ROM ex Am/Can/Bda Ch Sea Isle Rhapsody of Halstor and whelped July 13, 1965. "Peter" was acquired by Tom Coen (Macdega) as a young show dog. Under Tom's guidance he had an impressive show career: ASSA Specialty Best of Breed in 1968 and again in 1974, 105 Best of Breed wins, 3 all-breed Best in Shows, and over 40 group placements. His siring record was even more impressive. At the time the first ASSA Handbook was issued, covering the 1968 - 1970 period, the leading sire was Ch Timberidge Temptation ROM with 32 Champions. Peter had sired 12 Champions at that point, and the dog appearing most likely to beat Temptation's record was Ch Lingard Sealect Bruce ROM, who had just tied with Ch Merrymaker of Pocono ROM for 4th place with 25 Champions. By the second ASSA Handbook, three years later, Peter was up to 49 Champions and Bruce had 42. Their final standings are 160 Champions, including 10 ROM's, for Peter and 46 including 2 ROM's for Bruce. Peter heads Part IIe of Line CHE and is in Family 2 Part I.
Peter's contributions to later ROM Shelties are overwhelming. There are dogs whelped within the last 10 years that are over 50% Peter, even though Peter does not even appear in a 3-generation (or sometimes more) pedigree of the dog. 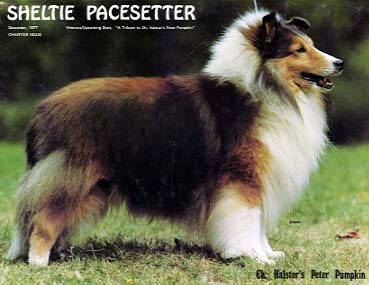 Ch Halstors Peter Pumpkin as the cover dog on the charter issue of the Sheltie Pacesetter.